That afternoon, Solobill was the guardian. He sent me the following log, with the first two comment lines; the other comments are mine. Thet title and the photograph are his. I (Solo) walked over to the beautiful new pavilion from the Zen retreat and found Adams, and Moon already on the cushions. Fael and Dakini followed shortly. Solobill Laville: Hello Adams and Moon! Solobill Laville: Oh, and the logo! Moon did a quick dance. Solobill Laville: Get down, Moon! Solobill Laville: Shake that thing! Fael Illyar: What does this “mini-retreat” mean in practice then? Solo talked about his all-SL retreat. Fael Illyar: Ah, doing things you’d do in a retreat but without leaving your home. Dakini Rhode: i missed the first part - are you on retreat? Different angles on different types of retreat. Dakini Rhode: Your 9-second mini retreat? Dakini Rhode: what are you doing specifically and would you like water carrying and woodchopping animations>? Solo then addes some more of the essentials. Adams Rubble: That is great that you had that experience. Can you tell us more about who does this? Dakini Rhode: that IS a retreat Bill! does it spill over into RL? Dakini Rhode: what is the key to the practice? Dakini Rhode: they are too small to see? Dakini Rhode: what keeps you going with it? Adams Rubble: ah. What do we NOT see? Adams, continuing her work on her Koan! The retreat thread continued, after the pixel thread stopped. Solobill Laville: Do you then, live life as a retreat? Solobill Laville: It is really more about the spirit of the way we hold ourselves daily, isn’t it? Adams Rubble: great chat ! Adams left, and the conversation kept its focus on the notion of a retreat. Solobill Laville: Does the wind move the flag? Fael Illyar: yes, at work is good time too … whenever you are waiting on something. Dakini Rhode: oh, the question, does the wind move the flag? Fael Illyar: I’m suddenly reminded of the few times when I was walking home from a friend’s place when things seemed much more vivid than normal. Now that I think of those, it was probably meditative state of some sort. Dakini Rhode: i think i see possibilities…. Dakini Rhode: dang every time i think i have a new thought…. Solobill Laville: I hate that! A new word was formed. Dakini Rhode: or i could say men! Not WHAT were Dakini and Fael talking about? Read on . . .
Solobill Laville: Were you talking about men? Solobill Laville: That’s what I thought!!! Dakini Rhode: oh my yes!!!! LOL! Dakini Rhode: now i’m laughing out loud! The cat is out of the bag . . .
Solobill Laville: Does a cat have Buddha nature? Moon Fargis: solo: a koan? Dakini Rhode: oh and the answer is…. drumroll…. Solobill Laville: Does anyone have anything else they’d like to chat about? Fael Illyar: Has a dog Buddha-nature? This is the most serious question of all. If you say yes or no, you lose your own Buddha-nature. The collection of koans seems to be growing . . .
Solobill Laville: Is that final stanza from Mumon? Solobill Laville: about losing one’s Buddha nature? 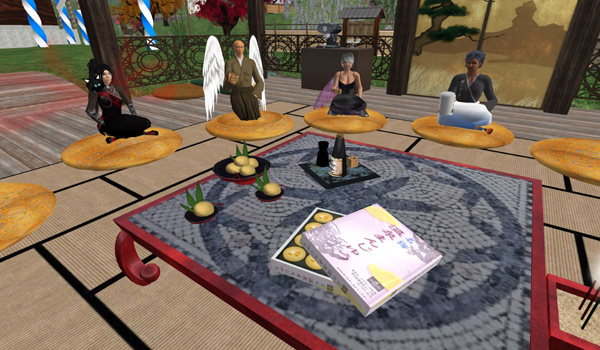 The conversation focused on Zen. Dakini Rhode: what do you zennies think now that i talk about what i do not know? Dakini Rhode: babbling zen masters? Dakini Rhode: did it stop your mind? Solo left, and the conversation become more staccato. Fael Illyar: hmmh, somehow this meeting has made me feel like just after meditating. But Solo was not really gone; after running he returned. Solobill Laville: What’d I miss? Solobill Laville: yes it is! Did Moon try to introduce yet another koan? Moon Fargis: wouldnt en then sexual independent? The conversation moved on to alcoholic beverages. Solobill Laville: Do they have Prosecco in Assisi?? Solobill Laville: Let’s conclude this session, and off to the pub!! Moon Fargis gave you Koeniglich-bayerisches Festbier (WEAR ME). Dakini Rhode: moon you have hiccups?